Generating payment checks from the E-Business Suite has traditionally required either a third party or considerable customization of the delivered check print reports. The check print format is very specific to each banking organization, requiring specific fonts and pixel-perfect layout. The existing E-Business Suite reports generate flat text output and do not support these features. Oracle XML Publisher now offers an integrated, cost-effective method to generate the check output directly from the E-Business Suite. Check printing from the E-Business Suite has historically required a third-party solution that can either query the necessary data and format the output or accept the existing flat text output generated by the provided check print programs. To then generate the checks, the format components had to be placed with pixel-perfect precision onto the page using the necessary MICR font to format the bank routing number and bank account of the payee. 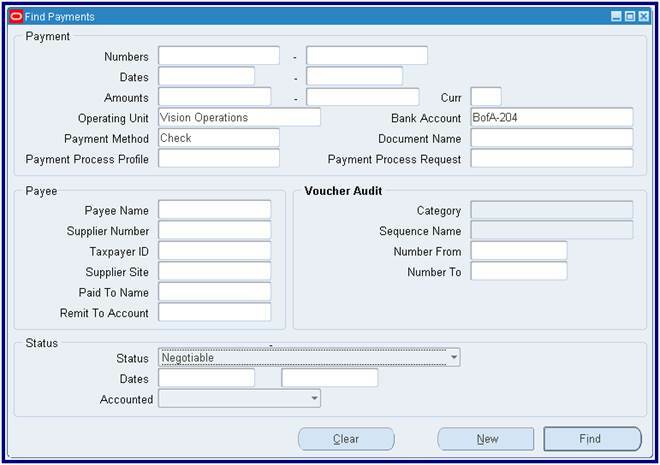 Alternatively customers could take the existing check print program and customize it to format the output correctly. These solutions are costly in terms of their implementation, their ongoing maintenance and their complexity. This all adds to the total cost of ownership for the E-Business Suite. Oracle XML Publisher offers integrated functionality that allows customers to design their own check format using familiar desktop tools that can then be applied to a check print data source, whether that is the seeded Oracle Report or a custom solution. This format is easily maintainable and can include all the necessary components required in the final output to be printed onto blank check stock. Taking this approach reduces the complexity of the systems surrounding the check generation and thereby reducing the total cost of ownership of the E-Business Suite. 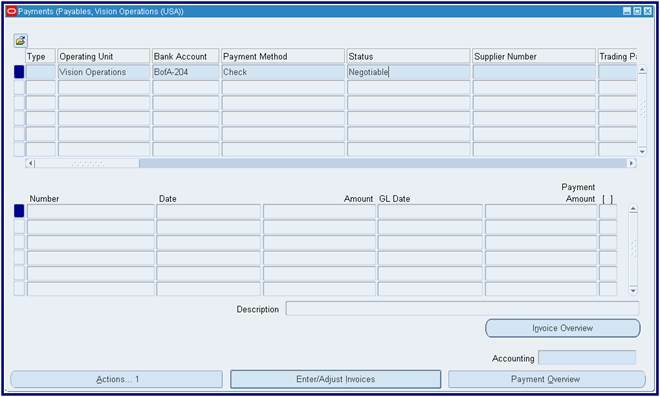 Basic requirements to start creating checks are to have an RTF file (Template) and an XML file (data definition). MICR Fonts. This is another important requirement which you will run into later on. So I have decided to address it right away because you may end up spending a lot more time if you start thinking about it later. One of the easiest way is to buy the MICR font from a third party like IDAutomation (http://www.idautomation.com/) and use MICRW1B.ttf. Typical cost is around $750.00 per user license – you may need to purchase only one license. You may also download their Demo version which is good for testing. The good news is that Oracle also provides a MICR font which is available if you have downloaded the BI Template Builder. Some banks reject this font, but so far I did not have any problem with the bank that we used. At this stage, you may or may not have designed the Check template. But you can still use IBYDC_STD1.rtf downloaded earlier. Following steps are needed to create a check in AP from scratch. These steps may also be used to create the initial payment to get the XML file. Query up your Bank Name. It is assumed that your Bank has already been setup in AP. Select the Bank Account and click on Manage Payment Documents. Important: If you check the above box, a new field called ‘Number of Lines per Remittance Stub’ will show up. This is number that you will have to find out by trial and error once you start testing your template. Initially, set it to a lower number, say 15. Enter any other information that you may need. Now you are all set to create checks. All you have to do is create an Invoice, or select any existing validated invoice for a vendor. There is one more thing that you must check before creating the payment. Query with format name(XX_APPS88_CHECK) and change the XML Publisher Template value to “Extract Identity”. Submission process for AP Checks/Payments has also changed in R12. Most of the options are now available in HTML screens. The good news is that you can create templates (Not XML templates - these are different) so that you do not have to enter the same information every time you submit a request. These parameters are sufficient to create a payment. Click on Submit in order to process. However, I do recommend following steps also in the begining. Click on Submit. Click on Home. Click on Monitor Requests. Note: All of the fields in this process are the same as in 'Submit Single Request'. Enter any fields that you repeat for request submission. In the above example, usually leave the Payee field blank if you want to run for separate vendors every time. Once the template has been created and saved, you may enter the template name in the field 'Use Template' in the example above. There are several other options which I haven't explored yet. I will add more once I get to try them out. 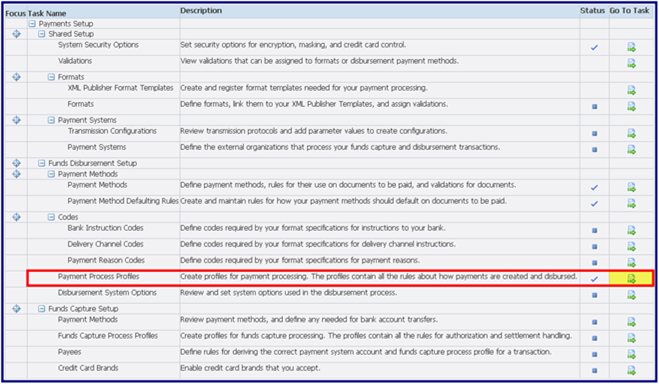 (Code: AP_AUTOSELECT_PKG): The Selection process is handled by Payables (AP), the calling product. When a PPR is submitted, a record is created in AP_INV_SELECTION_CRITERIA_ALL with a checkrun_name, which is the same as the PPR Name. 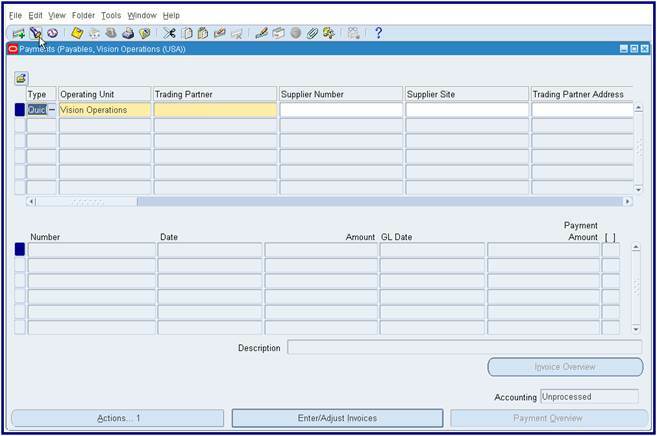 Selection: Invoices are then selected based on Due Date, Discount Date, Pay Group, and other criteria provided by the user while completing the PPR header. The table AP_SELECTED_INVOICES_ALL is populated with selected invoices. The table AP_UNSELECTED_INVOICES_ALL is populated with the invoices that were not selected. Locking:After selecting the documents, the invoices are locked to prevent other check runs from selecting the same invoices. 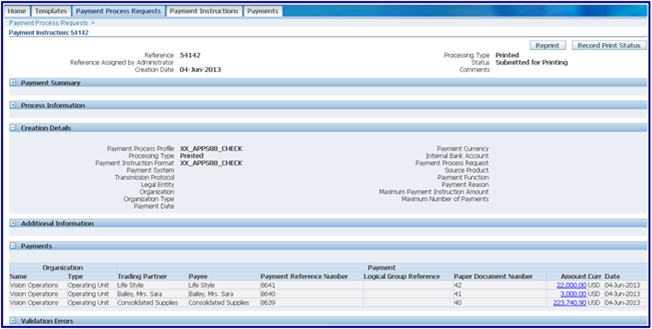 AP_PAYMENT_SCHEDULES_ALL.checkrun_id is populated on the selected documents (invoices). Review:If the PPR has been setup to Stop Process for Review After Schedule Payment Selection (option available on the header of the PPR), the process stops for user review after the initial selection of payables documents has been completed. The status of the PPR is set to "Invoices Pending Review". After the user reviews and/or modifies the selected documents, and clicks on the Submit button, AP calls the IBYBUILD program. If the Stop Process for Review After Schedule Payment Selection parameter was not enabled, then at the end of invoice selection, the Build program is submitted automatically. If no invoices met the selection criteria, the PPR is canceled automatically and the status of the PPR is set to "Canceled - No Invoices Selected"
(Code: IBY_DISBURSE_SUBMIT_PUB_PKG): The Build Payments process is handled by Oracle Payments (IBY). The Build Payments program first creates a record in IBY_PAY_SERVICE_REQUESTS with call_app_pay_service_req_code = checkrun_name. The Build Payments program goes on to populate the IBY_DOCS_PAYABLE_ALL table with the proposed payments. The link to the payment service request table is through the PAYMENT_SERVICE_REQUEST_ID. Internal Bank Account / Payment Process Profile Assignment(Code: IBY_ASSIGN_PUB): If the PPR has a default internal bank account and Payment Process Profile (PPP) assigned to it on the header of the PPR, the values are assigned to all of the selected documents in the PPR. 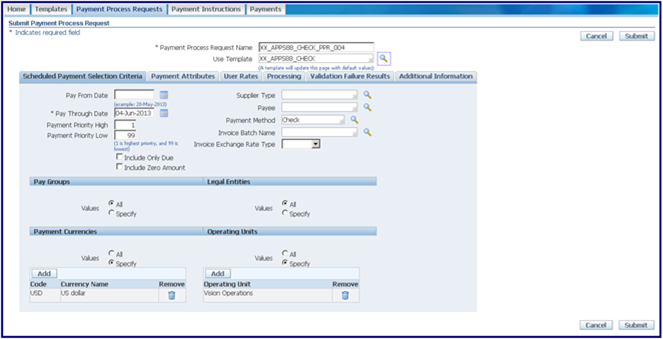 If a default internal bank account and PPP were not provided by the user on the header of the PPR, Oracle Payments attempts to default the values. If it cannot find a default value for all of the selected documents, the PPR status is set to "INFORMATION REQUIRED". 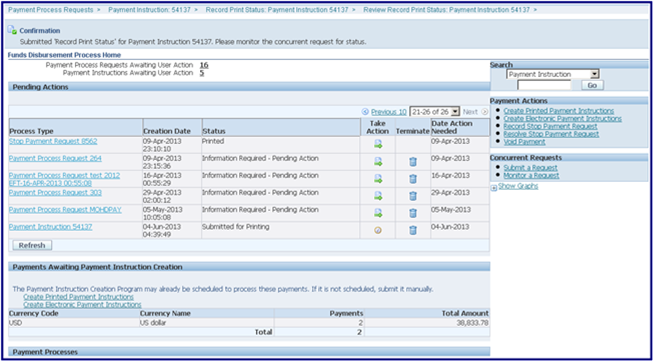 The user display shows it as "Information Required - Pending Action". The user will need to use the Information Required window to provide the missing internal bank account(s) and PPP(s) for each selected document. 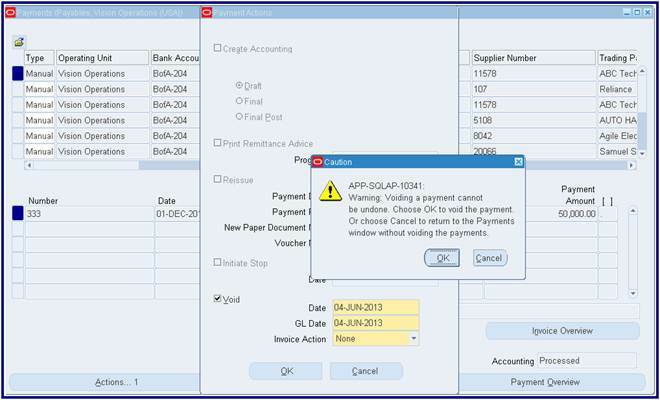 Document Validation (Code: IBY_VALIDATIONSETS_PUB): During this step, Oracle Payments validates all the documents (selected invoices & memos) using Pre-Defined and User-Defined Validations assigned to Payment Methods assigned to the selected documents. Afterward, the program validates all the documents again, using the Pre-Defined and User-Defined Validations assigned to Payment Formats associated with the PPPs specified on the PPR. If all the documents pass validation, all the documents are set to a status of VALIDATED in the tables and the request status is displayed as "Documents Validated". 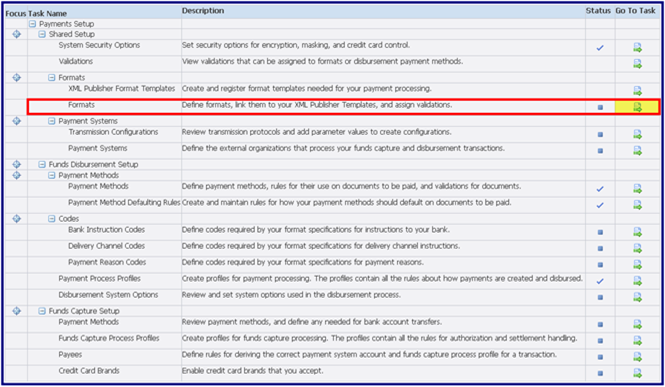 If there any document validation failures, Oracle Payments uses the parameter setting for "Documents" on the Validation Failure Results tab on the PPR header (the DOCUMENT_REJECTION_LEVEL_CODE) to determine the next action. (Code: IBY_PAYGROUP_PUB): The validated documents are then grouped into "proposed" payments based on the grouping rules - both User-Defined and hard-coded. It then numbers the proposed payments with an internal identifier (not "the" check number) and validates the payments. Records are inserted into IBY_PAYMENTS_ALL that holds the payment information for the selected documents (invoices). The Build Payments program then updates the IBY_DOCS_PAYABLE_ALL table with the payment_id and formatting_payment_id values of the payment associated with each document. 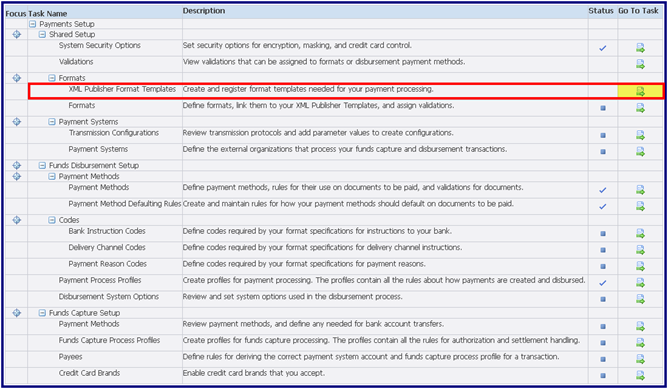 If there any payment validation failures, Oracle Payments uses the parameter setting for "Payments" on the Validation Failure Results tab on the PPR header (the PAYMENT_REJECTION_LEVEL_CODE) to determine the next action. If the PPR setup Stop Process for Review After Creation of Proposed Payments is enabled on the Process tab of the PPR header, the displayed PPR status is set to "Pending Proposed Payment Review". This status prevents further processing until user takes action. If this option to stop for a review is not enabled, the displayed status of the PPR is set to "Payments Created". In this status, payment instructions can be created for the PPR. 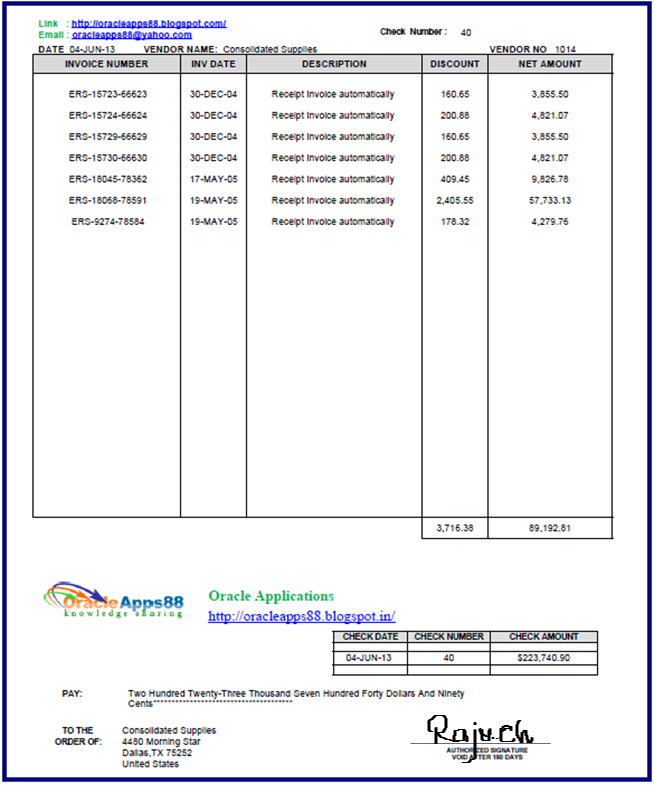 (Codes: IBY_PAYINTSR_PUB, IBY_CHECKNUMBER_PUB): The Format Payments process is handled by Oracle Payments (IBY). 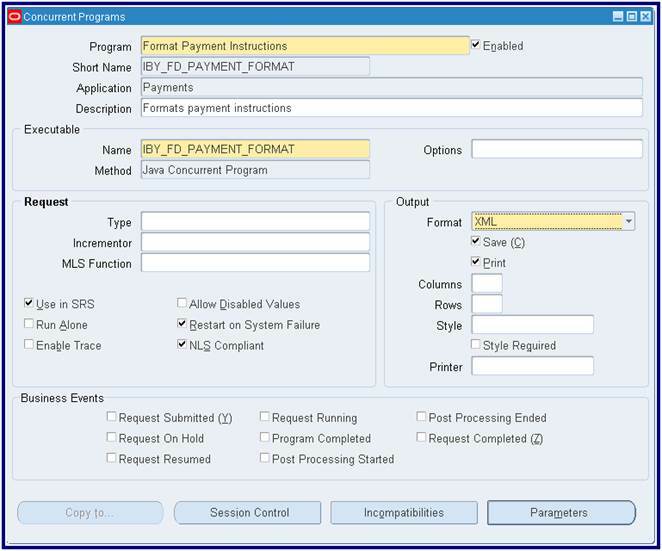 When a PPR is submitted, the program checks the setting for the Create Payment Instructions parameter on the Process tab of the PPR header to determine if the associated payment instruction(s) (PI) should be created automatically after the payments are created (the CREATE_PMT_INSTRUCTIONS_FLAG = Y), or if the program is to wait for a manual kick-off of the Format Payment Instructions program through the Standard Request Submission form (SRS) (the CREATE_PMT_INSTRUCTIONS_FLAG = N). If the PPR is set up to automatically submit instruction(s), the payment_service_request_id will be populated in IBY_PAYMENT_INSTRUCTIONS_ALL because the instruction will be specific to the PPR. In this case, the instruction(s) can be linked to the PPR using PAYMENT_SERVICE_REQUEST_ID. If the PPR is set up for the user to submit the instruction program manually on the SRS form, then when the instruction(s) is submitted, the instruction(s) is linked to the PPR through the payments selected by the instruction(s). The link in this case will be through the payment_instruction_id in IBY_PAYMENTS_ALL. Users can load stationery into the printer and print checks at this stage by clicking on the Take Action icon for the related Payment Instruction on the Search PPRs window. Determine if the checks printed OK, and if so, click on the Take Action icon again to be taken to the "Record Print Status" window, and click on the Record Print Status button. If there were problems with the printing process (paper jams, skipped checks, etc.) -- especially if you are using pre-numbered check stock -- use the Reprint button to reprint the batch and record any spoiled (ruined) and/or skipped check numbers. Electronic payments can be transmitted at this point. (Code: AP_PMT_CALLOUT_PKG): The Selection process is handled by Payables (AP). In order to confirm the printing of paper checks, the user needs to use the Record Print Status window to confirm which pre-numbered paper stock printed OK, and which (if any) were skipped or were damaged beyond repair ("spoiled"). Assigns sequence values for Document Sequencing (Vouchering). Creates data in the AP_CHECKS_ALL table with the appropriate data from the IBY tables. Inserts data into the AP_INVOICE_PAYMENTS_ALL table for the corresponding checks. 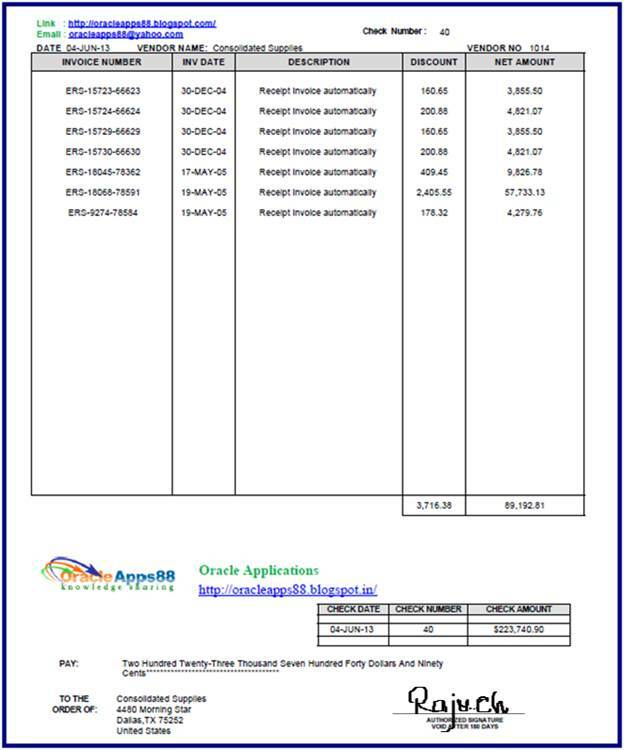 The documents (invoices) are updated in the AP_PAYMENT_SCHEDULES_ALL table to indicate in the Invoices Workbench the payment details and status. 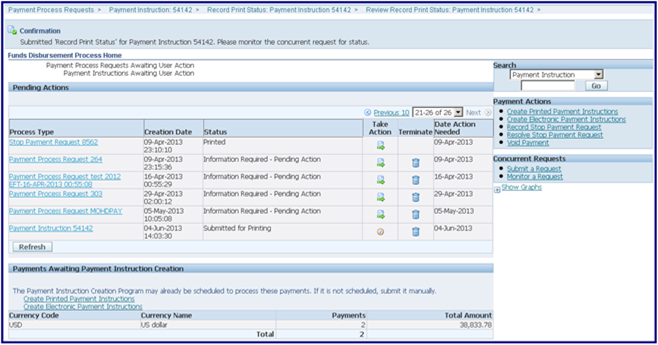 The documents not paid in this PPR are released by setting the checkrun_id on the Payment Schedules to NULL. The AP_INVOICES_ALL table is updated to show the payment status in the Invoices Workbench for those documents that were paid by the PPR. Data for this PPR is deleted from the AP_SELECTED_INVOICES_ALL table. Data for this PPR is deleted from the AP_UNSELECTED_INVOICES_ALL table. 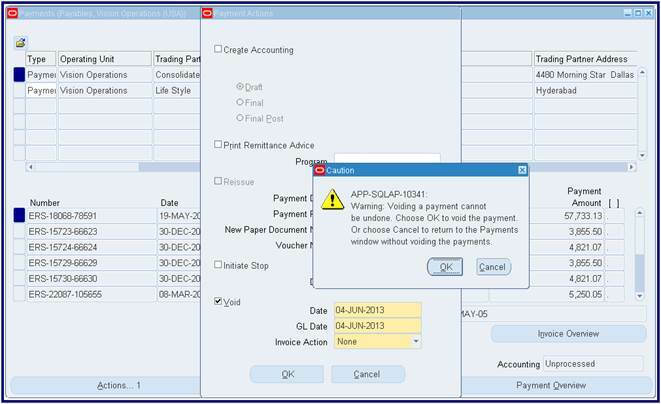 "Payment Instruction is Transmitted" = the payments will be marked as "complete" when they are transmitted"
This status indicates that the PPR has been successfully submitted for processing, and the AutoSelect program is digesting the criteria provided by the user on the header of the PPR in preparation of the automatic selection the invoices and memos related to that criteria. 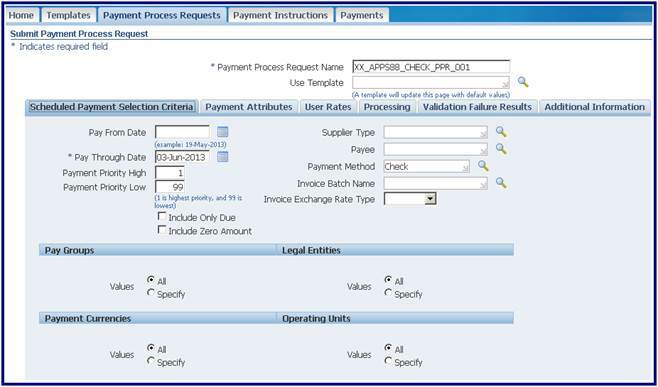 This status indicates that the AutoSelect program is selecting the eligible invoices/memos for the payment batch based on Due Date, Discount Date, Pay Group, and other criteria provided by the user on the header of the PPR. If no invoices or memos met the selection criteria provided by the user on the header of the PPR, the PPR is automatically terminated and the status changes to this status. Other statuses may appear at this point in the process if the user failed to included required information on the PPR header, such as "Missing Exchange Rates", etc. After selecting the documents (invoices/memos), they are locked to prevent other checkruns from selecting the same documents. This status will only appear if you selected the Stop Process for Review After Scheduled Payment Selection option on the Processing tab of the PPR header. This status means that the PPR process has stopped, and is waiting for you to review the invoices and memos that were selected for payment (and make any changes to the batch, as needed). Click on the Take Action icon to be taken to the Review Selected Scheduled Payments window. This status will only appear if you selected the Calculate Payment Withholding and Interest During the Scheduled Payment Selection option on the Processing tab of the PPR header. This status means that interest and withholding tax are being calculated and applied, as necessary, to the invoices and memos selected for this payment batch. An "interim" status, it appears after the calculation for interest and withholding has been completed, and the Build Payments program is starting. It may appear again later after the user provides any required bank account and PPP information for the invoices/memos ("documents") selected. This status appears if you did not provide a default Internal (Disbursement) Bank Account and/or PPP on the header of the PPR. In that case, you need to click on theTake Action icon to be taken to a form where you can decide which internal bank account and PPP should be used for each invoice and memo selected for payment. This status will only appear if you selected the Stop Process for Review After Creation of Proposed Payments option on the Processing tab of the PPR header. In this case, the system is waiting for you to review (and modify, if needed) the proposed payments for this batch. Click on the Take Action icon to be taken to the Review Proposed Payments window. This status indicates that the proposed payments have been turned into payment instruction files. At this point, you will want to click on the Show link to view the new associated payment instruction file(s). Each payment instruction file with have their own PI Reference Number. If you have both electronic and paper ("check") payments involved in this payment batch, you will see a payment instruction file for each type of payment method. An "electronic" type of payment instruction file will usually be marked as FORMATTED at this stage, which means the PI has been created, (and based on your setups) may also have been transmitted, and even marked as "Complete". A "check" type of payment instruction file will (based on your setups) usually be marked as FORMATTED - READY FOR PRINTING, which means the payment instruction file was created, and is waiting to be sent to your printer. Click on the Take Action icon to send the file to the printer. Afterward, the Status will change to SUBMITTED FOR PRINTING. Click on the Take Action icon again to "confirm" the payments (Record Print Status). This is also where the user will have an opportunity to "Reprint" the payment instruction file, if there were problems during the first printing process. Once the payment instruction file has been printed, an internal Payment Reference Number is assigned to the payment, along with a Paper Document (Check) Number. Once the user clicks on the Record Print Status button (and confirms it), the payment instruction file's Status changes again, this time toPRINTED. Once the payment instructions have been transmitted/printed and confirmed, the Status of the PPR changes to this status to indicate a successfully completed payment batch (PPR). If the user terminates a PPR anytime prior to confirmation of the payments (using the Terminate icon), the status will change to "Terminated", and the PPR is permanently closed. Payment Process Request Status Report: The Payment Process Request Status Report is a report that you can run that displays proposed payment information. You can request the report to run automatically after proposed payments have been created and validated or run the report by standard report submission. The report provides parameters, such as the Payment Process Request name/identifier and runs if the Payment Process Request status is "Payments Created". Payment Instruction Register: Once a payment instruction has been formatted, payments within that payment instruction can be reviewed in report format. The Payment Instruction Register can be run at any time after payment instruction creation. The report lists the various statuses of payments within the payment instructions, such as Formatted or Transmitted. Separate Remittance Advice:The Separate Remittance Advice is a report sent to a payee that lists the documents payable paid as part of each payment. You can specify the format for the remittance advice document and the delivery method. Positive Pay: A positive pay file is a security measure in the form of a document that the deploying company sends to its payment system or bank to inform it of payments made by check. When you print checks, then you can electronically transmit a list of payments to the bank or payment system that indicates the checks you printed, so the bank or payment system knows what checks to pay. This list prevents the payment system or bank from paying fraudulent checks, since such checks are not listed on the positive pay file. the Positive Pay File with Additional Parameters program.These programs replace the R11i report called the Positive Pay Report. amazing post thankyou so much ! Wow. That's very detailed and well put together. Well done and thanks for the post. This request finished with an error and produced the following completion message: Internal Error to Payment Server: \tmp\xdoIPiwbAekKZ072618_0308233020.fo (The system cannot find the path specified) The processing began on 26-JUL-2018 15:08:07 and ended on 26-JUL-2018 15:08:23. You may find more information on the cause of the error in the request log or the concurrent manager log. Please check with your DBA, It is temporary file path issue.